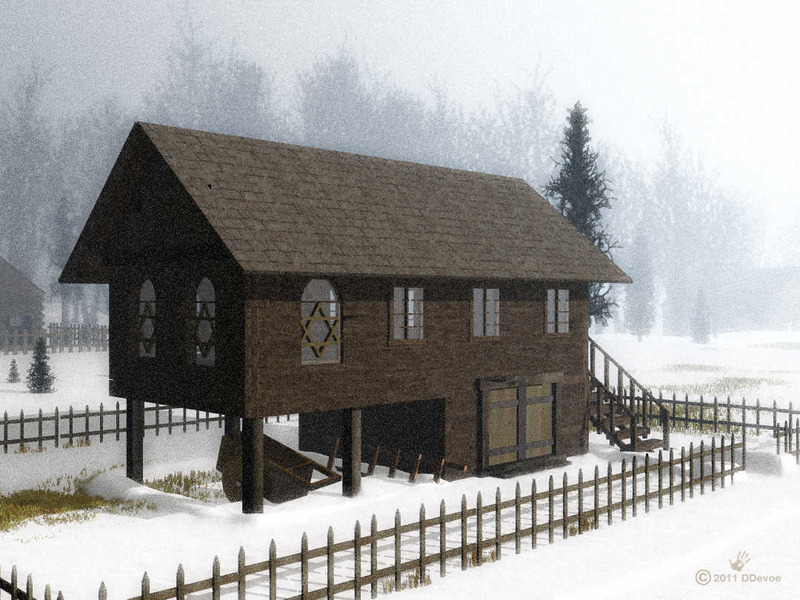 Here’s the shul (Yiddish for synagogue) in the mythical shtetl of Snezhnii somewhere in the Pale of Settlement. Pale of Settlement was the term given to a region of Imperial Russia, in which permanent residency by Jews was allowed, and beyond which Jewish permanent residency was generally prohibited. It extended from the eastern pale, or demarcation line, to the western Russian border with the Kingdom of Prussia (later the German Empire) and with Austria-Hungary. The Pale comprised about 20% of the territory of European Russia, and largely corresponded to historical borders of the former Polish-Lithuanian Commonwealth; it included much of present-day Lithuania, Belarus, Poland, Moldova, Ukraine, and parts of western Russia. At a number of cities within the pale also, Jews were excluded from residency. A limited number of categories of Jews were allowed to live outside the pale. software with a little post-procesing touch-up with soother graphics software. appearance, but I may try again with another image. This subject is very meaningful to me. It is a really good picture. Add some people and it will be great. Another winner.